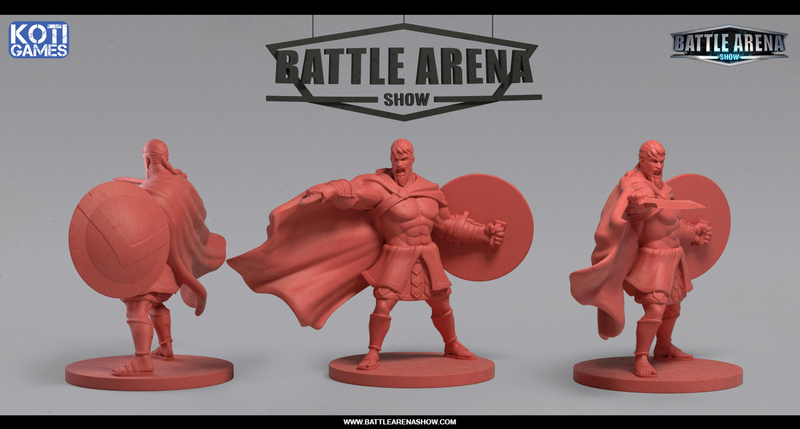 Hero miniatures I did for the Kickstarter board game project "Battle Arena Show ". Battle Arena Show will be launch through Kickstarter at April 7th. The game recreates the experience of the MOBA (Multiplayer Online Battle Arena) video games. If you want to encourage us, please back us up! Do you want to win a copy of Battle Arena Show? Enter our giveaway and get it! Battle Arena Show takes place in an alternate reality in which man has developed a technology that allows time travel. The game recreates a macabre television show, in which fighters brought from all parts of the world and from every conceivable age, clash in a battle to death for the prestigious title of Battle Arena Master. Two to six players organize into two teams that face each other. Each player controls one or more heroes, represented by great detailed miniatures, and each possessing powers that makes them unique. The heroes will fight in fierce and epic battles to destroy the enemy base while trying to defend their own.